Here’s a summer sequel I have been eagerly anticipating! Four years ago, we were introduced to young dragon-tamer Hiccup and his companion Toothless. The first Dragon was an enormously entertaining animated film, full of fantastic soaring rides in the sky, swooning and dipping in 3-D. Dragon 1 also told a beautiful story about learning to deal with one’s fears and reach out to that which is different. Hiccup showed his father, Stoick, that dragons need not be feared. When treated well, they proved to be great companions to humans. Dragon 2 takes up the action five years later. Hiccup is now a young man of 20, with a prosthetic leg from an injury he suffered in the first movie. Hiccup and Toothless are still soaring across the sky, along with Astrid and their other friends. Hiccup is worried that Stoick has chosen his son to be the next leader of their island, Berk. Hiccup is a peacemaker, and doesn’t know if he can be the kind of leader that Stoick wants him to be. Meanwhile, there is news that the evil Drago is turning the dragons against the humans. Hiccup decides to find him and persuade him otherwise. On the way, Hiccup discovers a beautiful island (looks like the planet in “Avatar”) where dragons fly free. There Hiccup meets Valka, the mother he never knew. Valka explains why she had to leave Hiccup as an infant. Searching for Hiccup, Stoick finds him with Valka, and falls in love with her once again. Hiccup eventually encounters Drago, who attempts to turn Toothless against him. The climactic battle scenes make great use of 3-D technology. A dramatic turn of events brings a dark emotional level to the film. Hiccup has to reach inside himself to become the leader that Stoick knew he could be. After the success of the first Dragon, director Dean DeBlois envisioned a trilogy of films. While Dragon 2 may not be quite as entertaining as the first film (it seems to stall a little on the dragon island), it is certainly a worthy successor. Visually, it’s incredibly sophisticated, with an amazing production overseen by 10-time Oscar nominee Roger Deakins. John Powell’s Celtic music is also a great asset. Dragon 2 is high-flying fun, yet there’s an emotional depth which most live-action films are unable to match. Hiccup is a great character, funny and vulnerable, trying to be true to himself and to his parents at the same time. As with other “middle films” in a trilogy (e.g. “The Empire Strikes Back”), Dragon 2 is a darker film in which the main character experiences loss and discovery. Can Hiccup be a leader and a peacemaker at the same time? 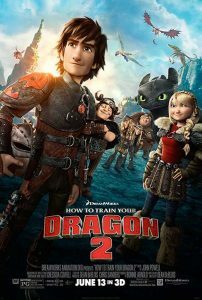 Even if you haven’t seen the first in the series, I think you’ll enjoy “How To Train Your Dragon 2.” It’s in the best tradition of animated films, which appeal to both adults and children at the same time. I’m already looking forward to the third installment in a couple of years.